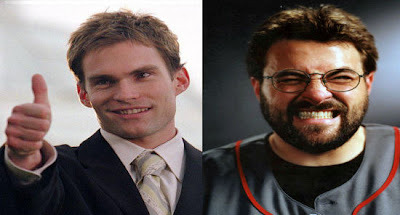 Kevin Smith tells NHL.com that Seann William Scott will play the title character Buddy, in his upcoming hockey drama. Buddy is a Scott who is primarily known for his role in the American Pie films as Stifler, would as Smith says have "his chance to shine." Smith explains that he thinks the yet to be penned script will change people's opinions on both William Scott and himself. He said, "It's my chance to do something big, epic in scale." Smith goes as far as saying Seann Williams Scott could achieve a "Tom Hanks level" which seems ludicrous. He said, "I look at this as Seann's opportunity to go to the (Tom) Hanks level." Kevin Smith's comments take me back to my earlier report, where Smith is quoted as saying, "If I play my cards right and we get the right people in it, it could be an award-type movie." Looking at his first choice, I certainly don't see it. But hell, I'm also not Kevin Smith and don't have this story in mind. I've seen Seann William Scott go far more serious than his Stifler days and think he has potential for a gem in his future, but a award-type movie remains to be seen. Kevin Smith also tells NHL.com now that he has a voice in mind, he can get to work on the script for "Hit Somebody." Smith tells the sports outlet that he can potentially get a script done within a month. He said, "Once I get going I could probably write it in less than a month, because it's all right here at the top of my throat, ready to go, and in my heart." He added, "In my heart of hearts I know it's Seann, it's so easy to go. Just easy to skate all-out when you have a voice in your head and I have his voice well in my head." Clearly all of Kevin's time with William Scott on the set of "Cop Out" got his creative juices flowing.